The Azure Automation Runbook Gallery now pulls runbook content from the PowerShell Gallery in addition to Script Center. To find scripts from the PowerShell Gallery, navigate to your Automation account > Runbooks, and then click the Browse Gallery command. After the gallery and filter blades have opened, you can use Gallery Source in the filters section to select the source for the script content. 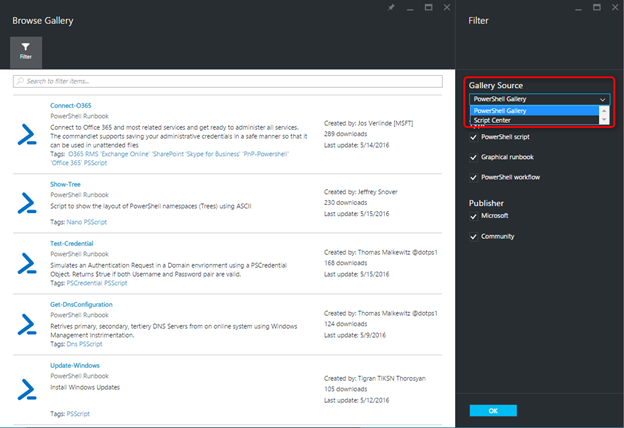 Select PowerShell Gallery and click OK to use the PowerShell Gallery as the source. When you use the PowerShell Gallery as the source, you can search by using free text, or you can search by keyword: value. For example, you can use Tag: O365 to find any scripts tagged with Office 365. You can also use the filters to search by script type and by publisher.